For app users, it's actually as much fun and helpful as you think it might be, even with Crosswalk's small user base (get your invite here). If you're interested in photography, for example, you can see what those who've tagged themselves as "photographers" are using. Though Apple only released the iCloud API in June, why hasn't anyone else done this yet? Crosswalk co-founder and President Tom McLeod tells LAUNCH, "We're not the first to realize that top sales lists don't reflect true purchase selection, or even attempt to solve app discovery -- we're just the first to do it elegantly." You don't need Crosswalk to tell you that Twitter and Instagram are popular apps, but Crosswalk knows what's trending among certain groups. "What we can tell you is that Oink is crazy popular among my group of rabid early adopter friends," says Tom. "In fact, 20% of my friends have it, and Crosswa.lk was how I discovered it even existed. As of this writing the app is fundamentally buried at #26 in travel on iTunes. I've been happily oinking all week." The iPhone version of Crosswalk is in the works. "We're waiting for more feedback so we can create the proper mobile platform the first time," explains Tom. We noticed that Crosswalk doesn't distinguish between iPhone and iPad apps -- that change is in the works, Tom confirms. Also to be fixed/amended: deleted apps showing up in your profile. LAUNCH has asked Apple about Crosswalk and will update if we receive a response. Tom notes that Apple has not been in touch with him or his co-founders (Patrick Jackson and Emil Anticevic), but he's not worried. "We imagine there will be one [response] eventually, and that it shows itself in the form of tacit approval," he says. "Bottom line, we're improving the ecosystem, we're using their platform to increase app penetration, and we're putting apps on the same pedestal for lifestyle influence as music and TV. There really are no downsides for anyone here." No doubt iOS developers can't wait for Crosswalk's developer platform so they know more about their audience and who to target. Tom's example: "They might think they've developed a kids game, but it turns out it's actually really popular with college guys." The developer platform could also be quite lucrative although Crosswalk has not set prices. "Developers tell us they are willing to pay a wide spectrum of subscription payments from 10's of dollars to 100's of dollars depending on how it translates to increased sales and awareness for them," says Tom. "As developers ourselves we currently spend well into the hundreds monthly on services to improve our app development and awareness. We're planning on offering scaled plans that will fit the budgets of various sized developers." Crosswalk raised seed funding from XOL, a group of ex-AOL employees. Tom, Patrick and Emil are also the founders of Washington, DC-based Imaginary Feet, which makes a number of mobile and web apps. Your page on Crosswalk shows the apps you've downloaded, with the most recent ones listed first. Click on the button showing the number of apps you've liked to see that list, ditto for the button showing the number of comments you've made. Note the tags under your box of followers/following -- click on a tag to see other users with the same tag [ everyone gets "unicorn" btw ]. The activity tab defaults to showing the latest apps your friends have downloaded and how many other people on Crosswalk have those apps; you can also see activity by comments, favorites and "all." Lists of recommended users and recommended apps appear on the right. The recommendations tab gives you a list of apps you don't yet have. Click on the "x" in the top-right corner of each suggestion to get rid of it. You can also see recommended users, which will first show Facebook friends already on Crosswalk, followed by popular users you don't follow and users with similar interests. 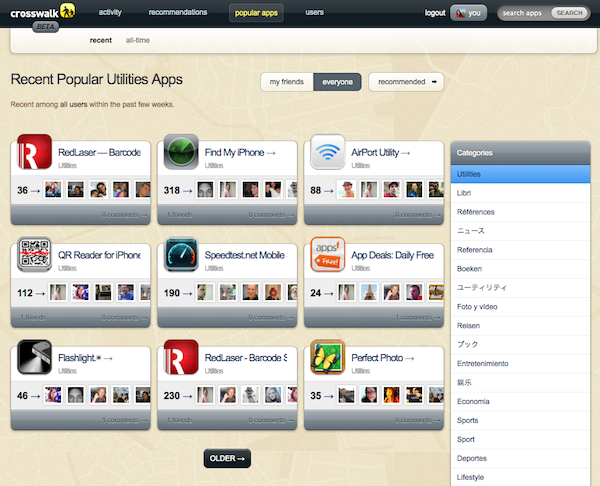 The popular apps tab lets you see what's popular among your friends or everyone on Crosswalk. You can also see what's popular in certain categories though the categories list needs some work judging by the assortment of languages [utilities apps shown here ]. At the top of the page for an invidual app you'll see its category, price, developer and number of users on Crosswalk who have it. You can comment or scroll down to see recent activity for that app. Part of the app developer's description from the App Store appears in the shaded box on the right. Click the "more on iTunes" to see the full description and all the screen shots.